This class represents the concept of a class name within the compiler. Symbols are a simpler way for the compiler to quickly associate types, declarations and names. Indepedent of the different kinds of declarations (declarations are statements), declarations can be considered to be definind and non-defining. See SgDeclarationStatement for details. where there exist defining and non-defining declarations symbols within Sage III always reference non-defining declarations (only non-defining declarations are shared within the AST). Definition at line 348312 of file Cxx_Grammar.h. This constructor builds the SgClassSymbol base class. 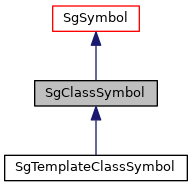 Cast function (from derived class to SgClassSymbol pointer). This functions returns a SgClassSymbol pointer for any input of a pointer to an object derived from a SgClassSymbol. Returns valid pointer to SgClassSymbol if input is derived from a SgClassSymbol.